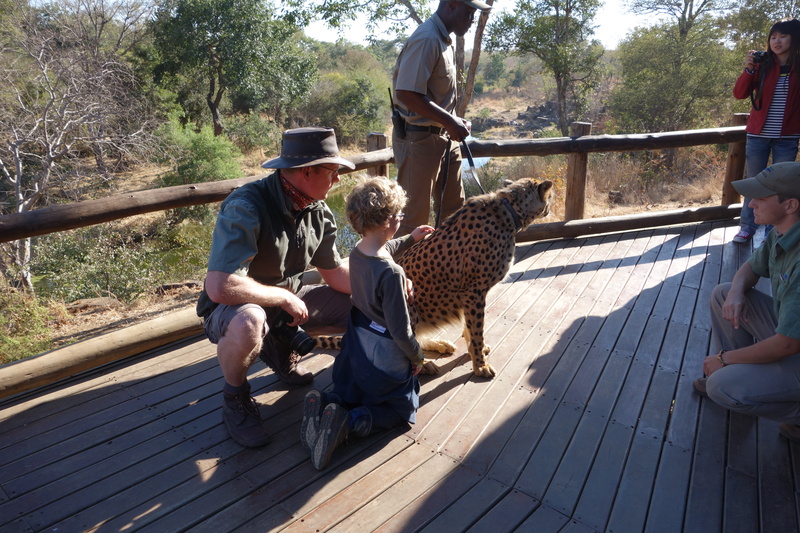 Last weekend we spent a few days in Vic Falls and were excited to meet the famous cheetah Sylvester, who lives in the private concession of “The Elephant Camp” a few kilometers outside of Victoria Falls in Zimbabwe. 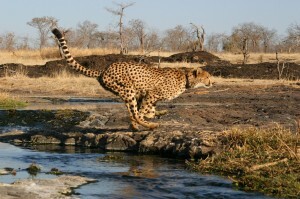 In April 2010, in the Lowveld area of Zimbabwe, a cheetah gave birth to five cubs. Sadly within two days, in a cruel act of nature, she and four of her cubs were fatally attacked by a male lion, something which is common between apex predators in the wild. The sole survivor was discovered by a game scout named Sylvester, who witnessed the event and the cub was named after him by Norman and Penny English who became his surrogate parents. Norman worked in National Parks and Wildlife Management for many years and now heads the anti poaching unit in the Bubi Conservancy. Penny is a registered nurse and having both their experience was invaluable in the attempt to keep this young cheetah alive. At two days old, Sylvester still had his umbilical cord attached and unopened eyes. permanent home for Sylvester, and in this regard VFWT became involved. Despite numerous release attempts, cheetah, apparently, do not survive in the wild without experiencing the maternal care of a mother for the initial twenty two months of their lives. The human imprints of upbringing in captivity are not conducive to a wild release with rehabilitated cheetah often coming into contact with human settlements and being seen as “problem” animals. they face being on the endangered species list. Guests at The Elephant Camp have the unique opportunity to experience Sylvester, learn about his endangered species and can support this good cause. We at Safari Destinations would like to raise awareness for this very important project. 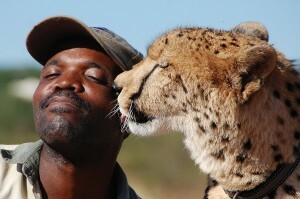 All travellers visiting Botswana want to experience the beautiful, remote places they’ve seen in the TV documentaries. The real wilderness Botswana has to offer that they don’t have to share with lots of other tourists. A safari in the out-of-reach corners of Botswana is an exclusive experience with a catch 22 about it. To get to these areas there are no tarred roads. Aside from the lack of tarmac, the distances are too big or the camps are surrounded by too much water, sitting on islands that can’t be reached…which is exactly why travellers want to visit, to experience a wilderness inaccessible to mass tourism. 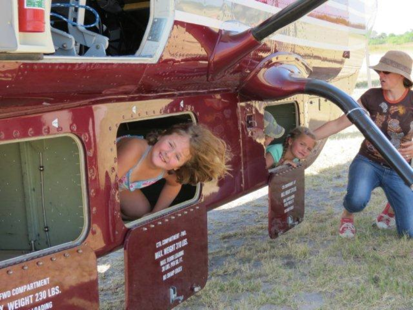 As a result, travellers need to jump into a light aircraft and let the pilot fly them into the adventure, wilderness & luxury camps that dreams are made of. Already the name “light aircraft” should give you the hint that we are not talking about an Airbus A380. For most air transfers charter companies use aircraft such as the Cessna 206 or Cessna 210 which can accommodate the pilot and around five passengers. If clients are really lucky they may fly in an Airvan which can transfer seven passengers and one pilot or possibly a Cessna Grand Caravan, which is as big as it gets, accommodating 13 passengers and the pilot. But that’s about it. Bigger aircraft would need to overcome a long brake path and can’t land on the short graded airstrips in the national parks and private concessions. With small aircraft comes this issue of fitting both luggage and passengers into the plane. All aircraft has a baggage compartment where the pilot stores clients’ luggage during their flight, but these are small and limited, meaning bags need to flexible (not rigid) and packed economically in order to make the most of the space available. Due to the small payload of these aircraft any other variations in the expected weight in the aircraft need to be factored in far in advance to avoid overloading and breeching safety regulations. This includes passengers weighing more than 100kgs. While it may seem an insensitive topic to broach, charter companies calculate their payload and required fuel based on passengers weighing 100kgs or less. As a result, charter companies need to be aware if passengers weigh more than 100kgs so they can limit the total amount of passengers and baggage accordingly. 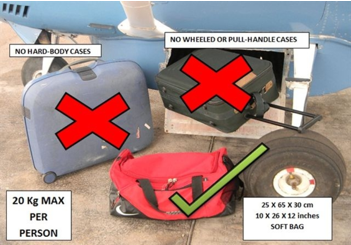 The restrictions in loading aircraft that result from flying passengers over 100kgs requires charging for an additional seat to compensate for the inability to carry the standard amount of passengers and luggage as a result. Luggage dimensions should not exceed 25cm (10 inches) wide, 30cm (12 inches) high and 62 cm (24 inches) long. Anything larger and the luggage will not fit. Baggage weight (including hand luggage) is limited to a maximum of 20kg. Luggage must be entirely soft-sided. Hard covered, rigid bags are exceptionally difficult to load and unload and will most likely be left behind. SD TIP! Due to the cramped space in light aircraft luggage holds, we also recommend taking camera equipment and other valuable items as hand luggage during flights to prevent possible damage. We know that restrictions are never pleasant but clients need to keep in mind that we advise them of these restrictions in advance so they can arrive prepared and enjoy smooth air transfers as a result. All rules exist to provide the maximum possible client safety and comfort on board. We understand our clients’ needs and know it is often hard to pack light for such a long journey; however clients can be re-assured that camps in remote areas usually include laundry service in the nightly rate. Clients are welcome to use the laundry service to minimise their luggage and rest-assured that the animals in the bush don’t mind seeing the same shirt twice. If clients can’t travel without excess luggage we offer to store the luggage at our office in Maun. The restriction however is that this only works if clients start and end their safari in Maun. If clients end their safari somewhere elsewhere we would need to send the luggage on (e.g. on a flight to Kasane) creating extra costs for clients who have already spent all their spare change on their trip of a lifetime in Botswana. If excess luggage storage is required, we need to know in advance so that we can make a plan prior to arrival and not during our short meet and greet with your clients at Maun airport. Please also keep in mind that if your clients are travelling through Johannesburg Airport multiple times, excess luggage can be stored there as well. To all travel agents & tour operators out there, please brief your clients about luggage restrictions connected to bush flying prior to travel. You can save your clients a lot of hassle if they’re aware of what to expect and how they need to be prepared for their journey of their lifetime.